On the occasion of World Colorectal Cancer Day, this Sunday, March 31, CIBBIM-Nanomedicine. 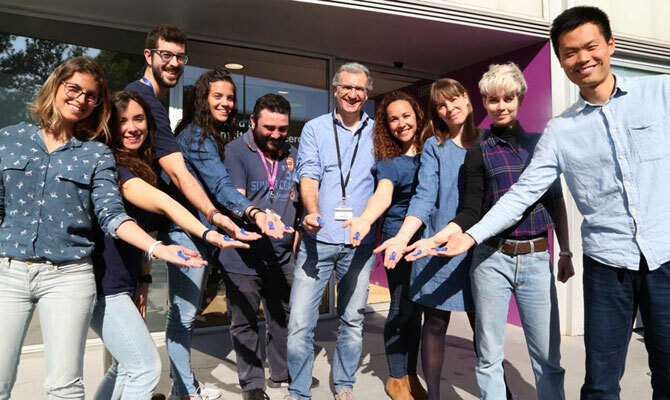 Biomedical Research in Digestive Tract Tumors of the Institut de Recerca Vall d’hebron (VHIR) wants to raise awareness among the population about the importance of early diagnosis and the acquisition of healthy habits to prevent its appearance. In Spain, colorectal cancer is the most frequent type of malignant tumor and the second to take more lives. Only in 2018, more than 37,000 cases have been detected, which means about 100 new diagnoses every day. The absence of symptoms in the early stages of their development is the reason why many patients do not consult their doctor, so the diagnosis occurs when the disease is in more advanced stages. If you have any of the symptoms and these last for more than 4 weeks, do not hesitate and consult your doctor. Age is the main risk factor for the development of colorectal cancer. 94% of cases are diagnosed in people over 50 years of age and it is estimated that this type of tumor will affect 1 in 20 men and 1 in 30 women before reaching the age of 74 years. But not everything is bad news. When the diagnosis is made in the initial stages, that is, when the lesion is limited to the mucosa and there is no lymph node involvement, the 5-year survival is 90%. This means that early detection of colorectal cancer is curable in 9 out of 10 patients. Check the infographic we have prepared and will help you to understand this disease better. So, you may wonder, how can I benefit from the early detection of colorectal cancer? The Autonomous Communities have deployed a screening program aimed at all men and women between 50 and 69 years of age, which consists of doing a simple test every 2 years to detect if the stools contain small amounts of blood that we are not able to see simple view. The invitations are made by means of a letter sent to the address which it indicates where to collect the device for the collection of the sample (mainly collaborating pharmacies and primary care centers), how the test must be completed and where to return it. A few weeks after performing the test you will receive the result by mail or phone. In most cases (more than 95%) the result of the test is negative and after 2 years you will be invited again to repeat the test. In the remaining 5%, there will be evidence of occult blood in stool so it will be necessary to determine by means of a colonoscopy if this is due to benign lesions, the known polyps, which will have to be monitored, or by a tumor. Early detection through these programs reduces short-term mortality up to 35%, which in Spain is equivalent to saving some 4,000 lives a year. So inform yourself, put yourself together, do not be embarrassed and go for the test! We have a lot to win! The Biomedical Research in Digestive Tract Tumors group develops projects focused on two main pillars: the understanding of the biology of digestive tumors and the identification of groups of patients most likely to respond to different therapies. The first ones aim to characterize the role of certain molecules to understand the mechanisms that lead to the onset, development and progression of colorectal cancer; and find new treatment targets. And the second pillar allow oncologists to make informed decisions about what type of therapy to use in each patient to increase the likelihood of cure, thus contributing to the personalization of colorectal cancer treatment. If you are more interested in what we do, visit our group; and if you wish, you can contribute financially with a donation to help us get it, click here!